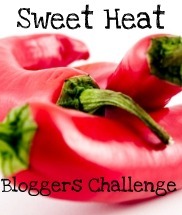 In my last post I gave you the recipe for the Pepper and Tomato Salsa which I served with the meatballs. 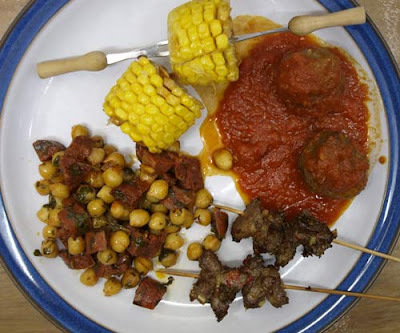 Also on the plate above there are Lamb Skewers with Lemon and Chickpeas and Chorizo so here are the recipes for these two dishes. Mix together the garlic, onion, lemon rind, corainder cumin, vinegar and olive oil in a non-metallic dish. Add the cubes of lamb to the dish cover with clingfilm and marinate for 2-6 hours, turning occasionally. Thread the lamb onto skewers, put these on an oven tray and cook in a hot oven (220C) for 10 minutes until tender. Cut the chorizo into cubes, heat the oil in a pan and add the onion and garlic cooking until soft but not brown. Stir in the chorizo and chickpeas until heated through. Splash in some sherry vinegar and season to taste. Serve warm sprinkled with chopped parsley. 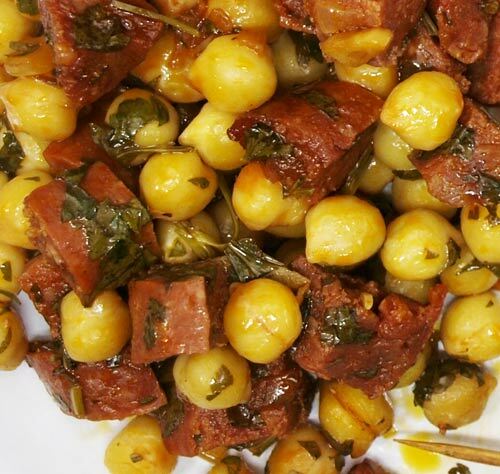 I only used a small quantity of the lamb to make the skewers so browned off the rest in a frying pan and added it to the left over Chickpeas and Chorizo and made it into another meal which we had today. I am entering this for Frugal Food Fridays, no photo, it doesn't look very different from the Chickpeas with Chorizo except with more bits in it! This month FFF is hosted by Pigling Bland why not join in? I cannot tell you how much I love tapas. I think I may have been Spanish in a previous life! I haven't tried the lamb skewers before but I will be as soon as possible! Thank you! Tales of Pigling Bland and of course there'll be a round up at the start of April.